Welcome to our careers FAQ. Here you will find all the answers to the most important questions about your career at Bigpoint. How is working at Bigpoint? 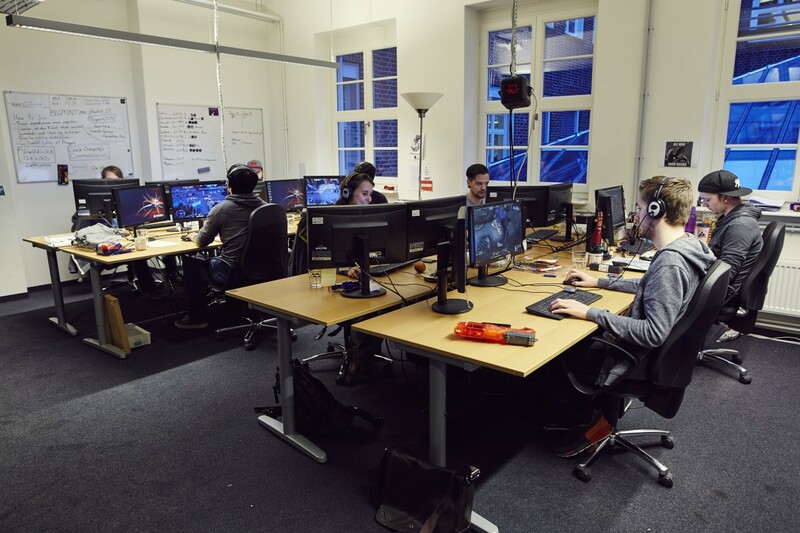 At Bigpoint we work together with passion since we believe that everybody should be able to play great games. The general work atmosphere is easy going and casual. We are searching for new team members who want to contribute to our vision. Our offices are located in the center of the city and are equipped with modern furniture. If you want to join Bigpoint, please have a look at the current job postings on our career page and apply directly on our website by uploading your CV and any additional files. Applying with your LinkedIn profile is also possible. To deal with the high number of applications, we are working with a recruiting tool that makes the recruiting process easier for all involved. Don’t worry, the tool will not discard applications and helps our recruiters that screen every single application as soon as possible after they haves been received. To easily process your application you should provide a motivational letter, a complete CV, and relevant certificates as a PDF file. Make sure to state your earliest possible start date and how you found out about our job offer.. It definitely helps if the resume is precise, easy to read and shows your relevant experience and skills that you bring to the role you applied for. We want to see why you applied and why you could be who we are looking for. If you apply in a creative area, please include work samples (portfolio, reel, etc.). They should be as up-to-date as possible and should contain your showpieces. It is more about quality than quantity here. Last but not least, don’t forget your phone number and email address so we can reach out to you. We are an international team and work with people from all over the world. Please make sure to hand in your application in English so everybody involved in the recruiting process can correctly evaluate your application. Speaking English in the company is required. Communication (meetings, emails) is generally in English. It’s not necessary to speak German to work at Bigpoint. However, it may be required for certain roles. We also offer German and English courses. Is it possible to apply for more than one position? In general, you can apply for every role you’re interested in. Nevertheless, your documents should match the new job requirements. However, you can be sure that our recruiters consider candidates for all our open positions and always try to find the best suitable fit. Can I send a initiative application? If you don’t find the role you’re looking for, feel free to send your application to our recruiting team at recruiting@bigpoint.net. We will then keep your profile in our system and will get back to you if a suitable opportunity arises in the future. Do you accept applications from outside of Germany? Of course, we are hiring great talent from all over the world. We are happy to receive your application – wherever you come from! If not explicitly mentioned, you don’t even need a working permit for Germany at the time of your application. We can support you in getting visa and a working permit once you are successful in the application process. We can also provide support with relocation. Our recruiting team will try to ensure a smooth and quick process. After you submit your online application you will receive an automatic confirmation receipt. Your application will be screened and after a few days we will personally get back to you with the outcome. In case it’s a match, we will let you know how and when to start the interviewing process. Our goal is to act fast during the whole process. Nevertheless, we pay attention to every application and want to get back to you personally, so please keep that in mind if it takes a bit longer during busy times. If you want to know anything about us, the role, or the team during the process, please let us know and we’ll be happy to help! Can I prepare for my interview? First of all: Don’t be nervous. We are only humans. Be sure to inform yourself about Bigpoint and our products as best as possible. It would be great to learn more about your motivation, interests and your connection to games. We want to get to know you better, so just be yourself and don’t be afraid to ask questions. We work in a casual environment. There isn’t a dress code for interviews or a regular work day. Choose something you feel comfortable in. Do you offer apprenticeships or traineeships? From time to time we offer apprenticeships. You can find all of our open positions on our job board. If you are looking for other entry-level positions, we also offer internships on our career website. Unfortunately, it’s not possible to work remotely for any of our current positions. We want to ensure close communication. We offer a variety of fresh organic fruit, water, tea and coffee every day. As a Bigpointer you have special employee discounts, such as vacations, clothing, food, electronics and much more. We also have cooperation with gyms, but also an onsite fitness room in Hamburg and courses with trainers, like a Yoga class. Of course, we have a gaming lounge with several consoles and PCs, but also an after-work lounge with sofas, football tables, table tennis and darts. On Thursdays we love to meet there for our happy hour with soft drinks and beer. We also offer regular company and team events. You can bring your dog to work every day and if you like to go to work by bike, we offer indoor bicycle parking and a shower, but also support public transportation tickets. There are team budgets for education and personalized training and we take care of a good work-life balance. We offer flexible working hours. Our core working time is from 10am to 4pm. In a full-time role with a 40 hours week, you work 8 hours a day and you can organize your day on your own as long as you’re here during core working hours. That means we have a flexible time frame from 7:30 am to 10 am and from 4 pm to 6:30 pm. At Bigpoint Germany there are 26 days of paid vacation per year. Moreover, the offices are closed on the 24th and 31st of December. In Hamburg there are 10 public holidays and Berlin has 9. Can I visit the office and meet people spontaneously? We hope you understand that during a busy work day we usually don’t have the time and are not prepared for spontaneous office tours or interviews. Therefore, please avoid showing up at our office without an invitation. If you convince us during the recruiting process, we will of course give you a chance to meet us in person and will invite you to visit the office. Moreover, from time to time we have special events where you can get the chance to take a look behind the scenes.